Many of you already know my that my daughter (and me) are obsessed with Lalaloopsy Dolls. I've been meaning to post this project that I made for her Lalaloopsy birthday party for a while, so here it is. Paint pots with acrylic paint. Let dry. When completely dry, add sealer and let dry again. In the meantime, cut out various flowers with any dies or machine or punches you have. Layer the flower on each other for more dimension. 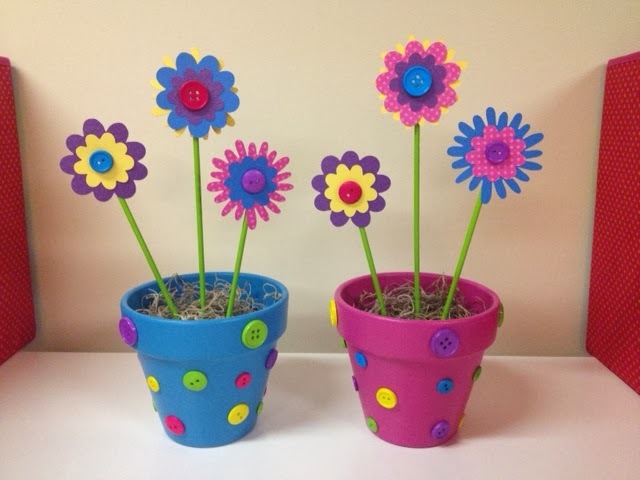 Add buttons to the middle of the flowers. Glue the flower to the painted dowels. Glue more buttons on the pot. Glue the moss to the top of the Styrofoam ball and place it into the pot. Dip the bottom of the dowels in glue and push them into the Styrofoam ball. These make great centerpeices for a party or decor for a playroom.